What type of bike for me? I hope you don’t think from reading this blog on a regular basis that I’m an elitist road bike snob because although I’m a very keen road-biker I’m also keen to get women to ride bikes of any type. I ultimately believe if they catch the bug they’ll end up on a road bike, but really any riding is good in my view. 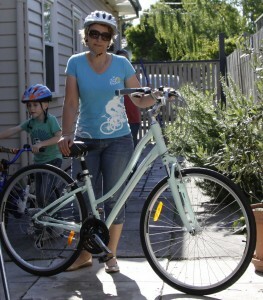 Last weekend I did a few laps around the block on my sister’s new comfort style bike. It was sort of fun rolling along with my seven year old nephew in tow and his father right behind him keeping guard. Here’s the photographic evidence. No lycra in sight!!! So I’ve done my research and thought I’d give you a simple run down on the different sorts of bikes you could consider if you’re just starting out. My first bike, other than the ones I rode as a child & teenager, was a road bike but many people work their way up. Plus, there are plenty of people who are very happy to have a bike to just ride with their kids or use it to get to their local shops. All fine by me. All cycling is good in my view. Obviously my favourite type of bike is a road bike. Road bikes have a fine frame, thin tyres, a short wheelbase and drop or flat handlebars. They are light and designed for speed but not as strong structurally as mountain bikes. They won’t stand up to any off road work (we all learn this the hard way) and are only meant for use on firm surfaces like bitumen roads and paved bike paths. If you have plans to enter triathlons, charity rides or commute to work on roads or cycle paths, then a road bike is for you. Touring bikes are good for long distances and for carrying cargo. They have a bigger frame triangle and are structurally stronger than road bikes. They still have the drop handlebars and more gears than a simple road bike. The lower gears are particularly useful when you’re trying to move a load up hills. Mountain bikes have wide tyres and suspension that absorbs shock, making for a more stable ride and a bike that can handle rugged terrain. While they are not as fast as road bikes they do have a wider range of gears suitable for climbing. If you plan to do more on road riding than off, or a combination, you can put on slick tyres that are better suited to bitumen. Mountain bikes are also very good as touring bikes although you can’t pack gear around the suspension so it can limit what or how you carry gear. BMX bikes have a low seat position that is uncomfortable over any distance, although children may find them okay. The lack of gears also makes climbing hills on a BMX a challenge. These bikes are designed for dirt racing, street riding and ramps. My teenage nephew loves his BMX and performs amazing tricks. He calls our road bikes – lycra bikes!!! Think of a cross between a road and a mountain bike and you basically have your hybrid. Hybrids combine the best features of both bikes. They make for very good riding on shorter paved rides. They have slimmer frames than mountain bikes and narrower tyres but slightly raised handlebars for a comfortable upright position. They do perform better on road and are generally used for leisure or commuting. They are generally a little more comfortable and stable than road bikes but not as fast and don’t have as high a gear range as a mountain bike. These old style bikes are the easy ride of the bike world. They are commonly used for shopping, going to the beach or a general amble. They have wide tyres and seats and usually just one gear, which means they are best used on flat terrain. They also have upright handlebars that enable a good viewing position of the world around you. There are plenty of other more unusual bike types, many of which you’ll see particularly on charity rides like the Gong Ride including recumbents, electric/power-assisted, folding, tandem, fixed gear (known by groovy inner city types as fixies) or single speed, unicycles, penny farthings, tricycles or even cycle rickshaws. The message from me is no matter what type you favour, don’t let it gather dust in the bike shop, or worse still your garage – get out there and ride!!! And of course the best bike of all (which you missed) – the Track Bike. Only to be used by the cycling purest. The simplest and yet best of them all. You can’t really call yourself a cyclist until you have “raced” track. Good pick up Stu (or should I say Track VP of LACC).